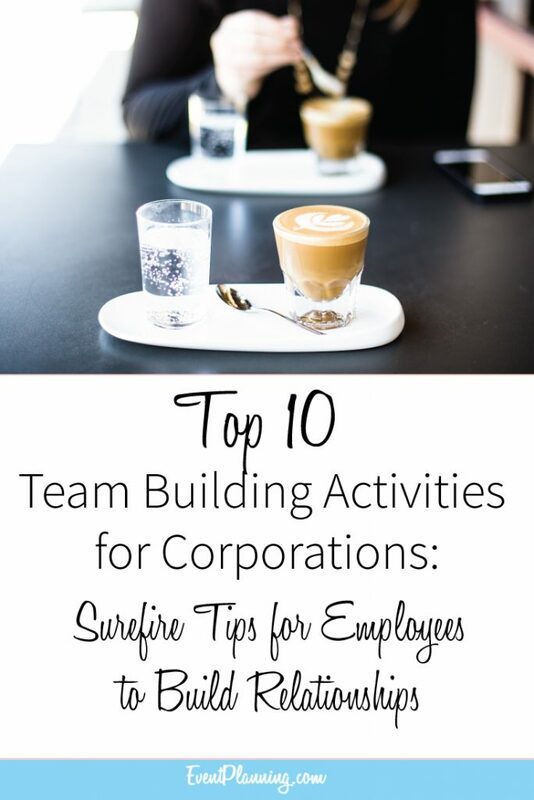 Picking a team building activity for a large corporation can be a tricky challenge. There are so many different types of team building activities to choose from: classroom team training, charity team building events, outdoor scavenger hunts, survival schools–the choices are endless! So how do you choose the right corporate team building activity for your team? 1.) Zip Line Tours: A daring way to challenge your team is to take them on a swinging adventure through a zip line tour. There are currently over 13,000 zip lines in the U.S.A. alone, and zip-line tours are expected to grow steadily over the next five years. Gliding among the treetops, soaring over the mountains and feeling the wind brush against your face is an exhilarating experience for your employees. Zip line tours are a wonderful way to boost your team’s confidence, help them support one another and build long lasting memories. There are a number of zip lining tour companies around the country to pick from. About.com came up with this handy list of the most extreme zip lines in America and visit Ziplinerider.com for a complete list of zip line locations around the world. 2.) Scavenger Hunts: Organizing a scavenger hunt is a great way to get your team to work together and foster friendly competition. One of the best parts about a company-wide scavenger hunt is that it can be completed on company grounds or in a new and unique location (such as on a company retreat.) To begin your company wide scavenger hunt, be sure to pick items that will be easy enough for your team to locate, (visual scavenger hunts, in which employees take pictures of the items that they are supposed to find, are often a good way to go) and have your employees locate items that are of some relevance to the company. By having your team work in smaller teams, with each team member assigned an appointed task, they will learn how to communicate effectively with one another and how to work as a team. To learn more about how to plan a scavenger hunt, take a look at this helpful article from eHow. 3.) Cooking Schools: Spice up your team building activity by having your team whip up a delicious meal! Taking your team to a cooking class is a great way to build teamwork and inspire collaboration. And at the end of the lesson, you and your team will get to enjoy a delicious meal! There are a number of dishes you can choose to have your team make, ranging from hors d’oeuvre to preparing a full 5-star menu. A few of the top cooking schools that host corporate events include Parties that Cook which has bases in San Francisco, Portland, Seattle and Chicago, Ramekins, a culinary school based in Sonoma, CA and The Culinary Loft based in New York. There are a number of cooking schools to choose from, so be sure to do a thorough search of ones in your area to pick the right one! 4.) Wine Tasting: Wine tasting is a sophisticated and stylish way to help your team bond. One trick to picking the right wine tasting venue is to ensure that the venue not only has participants try the wine, but quizzes them about it as well. Wine quizzes are a great way to foster a little competition among your team (whoever scores the highest score wins a reward) as well as keep your team on their toes. Some of the top wine tour companies in the U.S. include California Wine Tours and a number of tours in Napa Valley and Sonoma County, CA. Do keep in mind that these areas are known for their wine, but that there is a wide array of wineries, wine bars, etc. around the country that offer wine tasting. For a modern twist on this activity, try taking your group scotch or beer tasting. 5.) Make a Movie: Why have your team watch a movie when they can make one? The art of filmmaking is truly a team effort, and by having your team work together to create one, you will be able to enhance their creative and communication skills. This is truly an exercise to test your team’s creative skills–have your team write their own script, audition for parts, assist with lighting, etc. Filmmaking is an innovative way to challenge every member of your team and ensure that everyone gets to participate. There are a number of workshops that can assist your team in making a film, including ScreenDreams Entertainment’s 15 Minutes of Fame Workshop, which can be done literally anywhere in the world, and Feet First Entertainment (which also offers a number of other team building activities) with spaces based in San Francisco, Los Angeles, San Diego, San Jose, Santa Barbara, Orange County, Seattle, Phoenix, and Dallas. 6.) Improvisational Comedy: Having your team take an Improv comedy workshop is a great way to improve their presentation, interview and communication skills. The basis of Improv comedy is based on teamwork; the entire team has to work together in order to create a strong and humorous Improv scene. Improv comedy also teaches one how to accept and advance others’ ideas, be more in the moment, and discover their creative potential. Some of the top workshops include I.O., which workshops based in Los Angeles and Chicago, Second City, which is based in Chicago, and StageCoach Improv, which brings the workshops to you! 7.) Classic Team Building Games and Challenges: When planning team building activities for your team, keep in mind that you can never go wrong with the classics! There are a wide variety of classic team buildings games and challenges that you can have your team do to help your team work together, get to know one another, and have fun. Incorporating balloons into your activities is a gentle and affordable way to get your team moving. Wilderdom.com has a great list of balloon-related activities for your team to enjoy. Tug-of-War type games, in which your team is split into teams and pull against a rope, can foster friendly competition among your team, as well as help teach them tactic techniques. For a complete list of classic team building games and challenges, please visit www.wilderdom.com/games. 8.) Walking Tours: Get your team out of the office and discover your hometown with a walking tour! There are so many different walking tours to choose from (depending on your location) and some of the top choices include: walking food tours, walking historical tours, walking art tours, etc. The trick is to find the right walking tour for your team. Certain walking tour companies, such as StrayBoots offers an interactive element to the tour. Described as ‘half scavenger hunt, half walking tour,’ StrayBoots has participants use their smart phones to solve riddles, find things and take goofy photos–all while discovering the city by foot. 9.) Get Cultured: Challenge your team’s intellectual and analytical skills by taking them to a local art museum. Most cities have a local art museum filled with interesting art that will challenge your team’s minds and hopefully foster new ideas. One way to really challenge your team is to have them go around the museum and pick their top five favorite pieces of work, and explain to the rest of the group why these pieces inspired them. This exercise will encourage your team to think outside-of-the-box as well as help them work on their presentation skills. Many art museums offer discounts for large groups, and some will even provide free tours. For a complete list of art museums in the United States, please visit www.artcylopedia.com/museums. 10.) Wilderness Adventures: If you really want to take your team on an unforgettable retreat, sans the resort and recreation, take them on a wilderness exploration and see how well they can fare in the wild! Wilderness survival courses have become more popular than ever lately (thanks in part to adventure novels such as The Hunger Games), and they are a quick way to get your team thinking fast on their feet. You can pick how extreme of a wilderness survival school you want to send your team to (some go as far as teaching you how to survive in the Artic) and for how long you want to send your team away. Certain basic skills that are taught at survival schools include nature awareness, indigenous survival, and Bushcraft skills. By attending survival school, your team will bond with one another, learn how to work together, and form some long lasting memories of their time in the wild. Some of the top wilderness schools for corporations include Mountain Shepherd Wilderness Survival School, with schools based in Catawba, Virginia and Tillamook Forest, Oregon and Lifesong Wilderness Adventures, with schools based in California, Oregon and Texas.